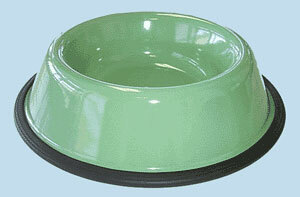 Slope-sided bowls are ideal for food and water, as a rubber ring along the bottom prevents sliding. Please wash by hand. Enamelware is subject to slight variations in the surface of the finish. These variations occur in the manufacturing process, and give the piece the character associated with baked enamel.